Musicians compete, too! In February, Megan performed in two events at what is called the MSBOA (Michigan School Band and Orchestra Association) District Solo & Ensemble Festival. This is an optional event that her music director strongly encourages the students to participate in. Megan has participated the last three years. Basically, you pick a piece of music, practice practice practice, then perform the piece in front of a judge. Afterwards, the judge verbally critiques your performance and then you await your results which are posted in the hallway. If you get a I or II you receive a medal for your performance. Megan and her friend Alexis performed a clarinet-flute duet and Megan and Kasey performed a clarinet duet. In the end, both performances received a "I" rating which is the highest score. I believe the rating system is I through V (Roman Numerals). Receiving a I rating qualifies you to enter into the State High School Solo & Ensemble Festival. I don't think I've mentioned it, but I also played the clarinet in high school. Both symphony band and marching band. Some of my fondest memories and bestest friends were the friends I made in music classes! Megan has, without hardly any bribery, followed in her old mom's footsteps. She is even using my clarinet from back in the day! This year, I would say that Megan has officially surpassed my playing abilities. (I would like to think it's due to my undying support and those private lessons!!!!) I have to admit, it is a bit surreal to share these experiences with your kid. The same things I used to do at her age!! High school sometimes seems like only yesterday to me!! This past weekend was the State competition. These girls have such busy schedules, it is hard for them to find the time to practice. I was not at all sure they had done enough of it before this competition. However, they surprised me and came through with "I" ratings again at the State level!!! No doubt, I have been struggling to keep this blog up to date with our lives. I realize all some of you can live your lives without my updates. However, if for no other reason than to create my own scrapbook, I need to get busy and crank out some updates!!!! In the meantime, I spent waaaaaayyyyyy too much time last night figuring out how to install a link to Instagram. At first, I set out to post the actual Instagram pictures on the sidebar of my blog. Then, I decided to just put a link instead. At least for now. The great thing about Instagram (it's free!) is that it's much quicker than putting a blog post together, or even giving a status update on Facebook. It's just an instantly uploaded picture...with or without a caption. So, if you have an Instagram account you can always take a peek of what I am up to that way. Follow me on Instagram and I will follow you back!! *I'm taking suggestions for a better Instagram user name...and yes my "real" name is already taken!! Well, hello there! The month of February was filled with quite a lot of time spent taking care of my mom. So, I guess I took advantage of the relative quiet after those few weeks and have been trying to focus more on things at our home and with the kids. I guess in some way I am constantly trying to keep things in balance and prove to myself that I do have a life outside of caregiving...although sometimes it does not seem like it!!?? All the while, I have been visiting and, of course, remained in touch with my mom. 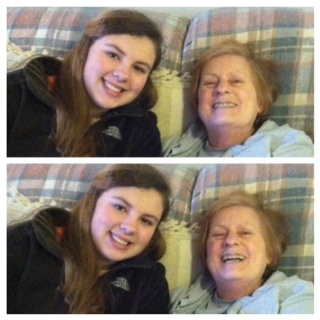 I visit with my mom at least once a week, and upon visiting a couple of weeks ago my mom told me she fell. I had not been advised of any fall. If the medical alert button is used or the staff is aware of a fall, I believe they are supposed to notify me. 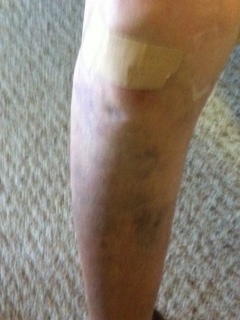 I was a little alarmed when my mom showed me her knee. It was a pretty big scrape and she had a small regular sized Bandaid across it. (That's all she has is the regular ones.) I went to the office of the Med Team to see if they could give me some gauze and tape to give it a better bandage. At that time, I was even more surprised to learn that they knew she had fallen. They said the housekeeping staff told them they saw her on the floor. At that particular time, I chose not to get into a discussion of why I was not notified (and why it appeared nobody even gave her a hand taping it up). I had my mom put her leg up and let her "boo boo" get some air. I then got my terrible nursing skills going and made a makeshift ice pack out of a makeup bag. As best I could determine, she had fallen the day before. My mom also told me she hit her head, but it was ok. Ugh!? Of course, I have no way of knowing for sure what happened. Did she hit her head, too? Was she ok? How did she get up? Did anyone help her? How do you get such a big scrape from falling on carpet? She says she fell when she bent down to turn on her tv. I have also been setting the alarm on my iPhone for 10am weekdays to try to determine whether my mom is now making it to the chair exercise class she is supposed to be escorted to. The first week or so, I found my mom answering the phone at those times. I would then contact the Med Team staff and remind them she is to be escorted to those classes. 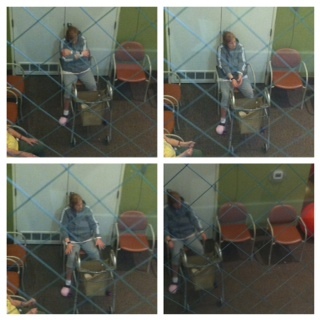 I was glad to peek down to the exercise room on a recent visit and find my mom in class. It appears I found them during the "cool down" session and I took a couple of minutes and watched. I know it looks like prison glass, but I was watching from one floor above the exercise room when I snapped these photos. On that day, I had planned to take my mom to the Michigan Secretary of State office to get a new handicapped parking permit and to replace her recently expired Driver's License with a State ID card. (Rest assured, my mom has not driven in a few years, but her Driver's License only recently expired.) It was very cold outside and I was disappointed my mom had chosen that day to were capri length sweatpants. When she came back to her room from exercise class, I helped her get dressed into long pants and I tried to do her hair and makeup a bit, as I figured she would be getting her photo taken for her ID. Of course, this all started the series of questions about where we were going and why. It is not unlike the movie "Rainman" (with my long time favorite, Tom Cruise). Remember the constant questions and agitation that would set in with the Dustin Hoffman character? Well, that is kind of what it is like. I was fairly pleased that I was able to throw some hairspray in her hair and work a little magic in a relatively short period of time. Meanwhile, I was dreading the common long wait at the Secretary of State office...it can be grueling. Thankfully, the Secretary of State office was pretty organized and after taking a number, we moved to the front of the line pretty quickly. For that, I was thankful. Before our trip, I had checked with the Secretary of State to learn more about my mom transferring from a Driver's License to a State ID. On the phone, they explained that she would just have to sign a document indicating she was "voluntarily" surrendering her license and that was all she needed to do. That was all....!!???????? Do they not know that taking away the car keys from my mom at the age of 66 was incredibly difficult on me and my mom? Do they know that the mere mention of the words "driving" or "driver's license" is guaranteed to trigger a series of questions from my mom about when she can drive and why can't she drive, etc...??? Oh, and how she never killed anyone driving or anything!? (Thank God!) I explained this to the lady on the phone and she indicated that the clerk's would be understanding of our situation. Yet, I was not anxious for this trip mainly for that reason. I decided to put the emphasis on the reason for our trip on the renewal of her handicapped parking permit and not the other part of our business. 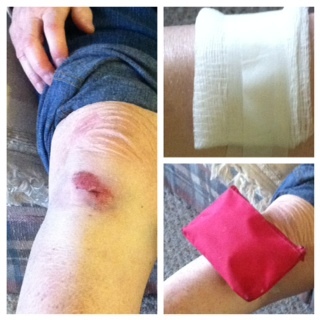 Meanwhile, I have been thinking about my mom's knee and her recent fall. I know I need to take some kind of action to express my disappointment with the system. Megan and me were at a music competition nearby recently, so we picked up some larger Bandaids and some pop for my mom. I was glad to see the scrape was healing and getting smaller, but this time I was surprised at the amount of bruising that had since appeared. Poor mom. She had two small Bandaids on it this time, and some scotch tape to make it stick better... I fixed her up and am hoping next week it will look better. I also brought a light bulb for my mom. Why, you ask? Well, our phone rang at midnight Friday night. I had just gone up to bed and my heart stopped. We listened as the machine picked it up before we got to it. There was my mom's voice explaining that the light bulb on her lamp on the nightstand burned out. To her, it could have been noon instead of midnight. We were relieved it was just a light bulb!! She was glad when we replaced it for her. I decided to let my mom know she had called us at midnight the night before to tell us about it. She was shocked... 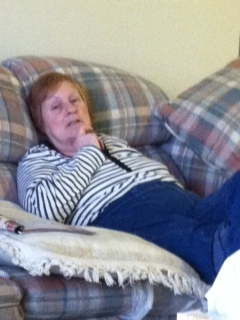 I told her it scared us when she called because usually when the phone rings late it is bad news or an emergency. She said, "well it was bad news and an emergency -- my light bulb burned out"!!!!!! She was having a good day and we got a good laugh out of it!!! You may recall awhile back the post I did where my husband got our family room painted. That has since also evolved into our upstairs hallway and foyer. I saw this on Pinterest and am not sure I would have put it on our "to do" list if it wasn't for how dramatically different the Before and After pictures were. I liked it and all these months later, we (ok, mostly my husband) are wrapping up this dramatic door makeover. I guess this may not be for everyone, but I am loving it! It brings a depth element to the overall look. Plus, it's just a nice change!! Meanwhile, I am so behind on keeping you peeps updated on this ol' bloggy scrapbook of mine. I am not going to make excuses (I have a million), but I will say we have been keeping busy and getting a lot done around here. 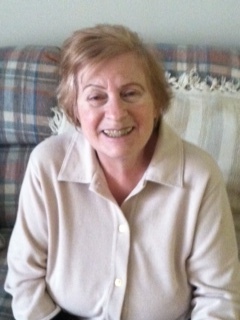 For those who have asked, my mom is still hanging in there and hopefully I will give an update on Monday. This was inspired by Pinterest and for us was definitely more of a game changer than a recipe or craft project!! What is your boldest Pinterest project ever??? **The pictures don't do it justice, but you guys don't want to wait another month for a post do ya?? ?